Institutum Historicum Societatis Iesu (IHSI) has published an important new book on the Jesuit Irish mission. 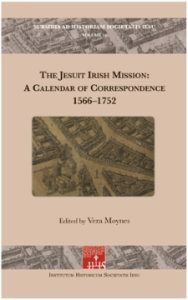 The Jesuit Irish Mission: A Calendar of Correspondence, 1566–1752, edited by Vera Moynes, is the first inventory of the correspondence between the Jesuit missionaries and the Jesuit leadership at the Curia. More information and ordering details are available on the IHSI website.